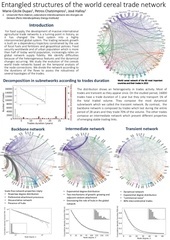 Entangled structures of the world cereal trade network Entangled structures of the world cereal trade network Marie-Cécile Dupas1, Petros Chatzimpiros1, José Halloy1 1. 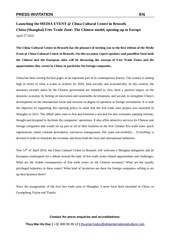 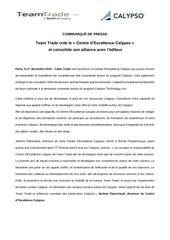 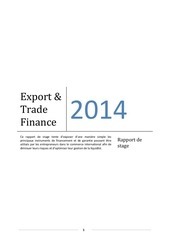 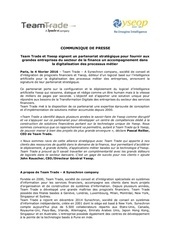 CPTeamTradeYseopFev2016 COMMUNIQUE DE PRESSE Team Trade et Yseop signent un partenariat stratégique pour fournir aux grandes entreprises du secteur de la finance un accompagnement dans la digitalisation des processus métier Paris, le 4 février 2016 – Team Trade – A Synechron company, société de conseil et d’intégration de progiciels financiers et Yseop, éditeur d’un logiciel basé sur l’intelligence artificielle pour la digitalisation des processus métier des entreprises, annoncent la signature de leur partenariat stratégique. 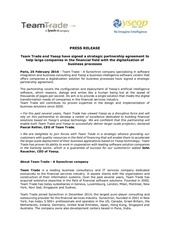 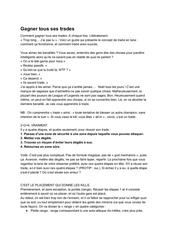 PressReleaseTeamTradeYseopFeb2016 PRESS RELEASE Team Trade and Yseop have signed a strategic partnership agreement to help large companies in the financial field with the digitalization of business processes Paris, 25 February 2016 - Team Trade - A Synechron company specializing in software integration and business consulting and Yseop a business intelligence software vendor that offers companies a digitalization solution for business processes have signed a strategic partnership agreement. 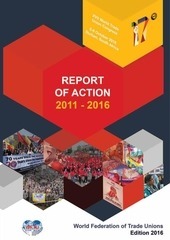 WFTU Report of Action 2011 2016 EN web 2 - 17th World Trade Union Congress Report of Action 2011-2016 DOCUMENT PREPARED AND PRESENTED BY THE WFTU PRESIDENTIAL COUNCIL TO THE 17TH WORLD TRADE UNION CONGRESS DURBAN, SOUTH AFRICA, 5-8 OCTOBER 2016 WFTU - Report of Action 2011-2016 - 3 World Trade Union Congress | 5-8 October 2016 | Durban - South Africa STRUGGLE - INTERNATIONALISM - UNITY Forward! 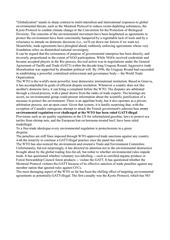 In the absence of any independent trade unionism, do these struggles always take the form of wildcat strikes or is the situation more complicated ? 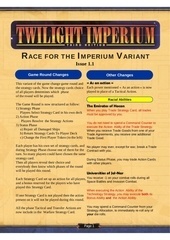 The Emirates of Hacan 1) Strategy Phase When you play Trade Strategy Card, all trades Players Select Strategy Card in his own deck must be approved by you. 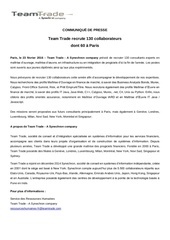 CP Recrutement 2016 TT COMMUNIQUÉ DE PRESSE Team Trade recrute 130 collaborateurs dont 60 à Paris Paris, le 23 février 2016 – Team Trade - A Synechron company prévoit de recruter 130 consultants experts en maîtrise d’ouvrage, maîtrise d’œuvre, en infrastructure ou en intégration de progiciels d’ici la fin de l’année. 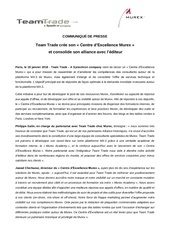 CPCentreExcellenceMurexJanv2016 COMMUNIQUÉ DE PRESSE Team Trade crée son « Centre d’Excellence Murex » et consolide son alliance avec l’éditeur Paris, le 19 janvier 2016 - Team Trade - A Synechron company vient de lancer un « Centre d’Excellence Murex » qui a pour mission de rassembler et d’améliorer les compétences des consultants autour de la plateforme MX.3 de Murex, mais également d’élargir et de consolider l’offre de services technique et fonctionnelle. 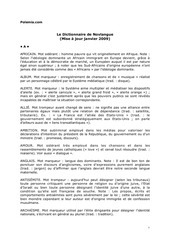 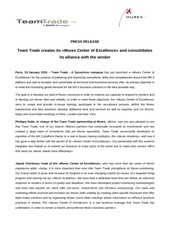 PRMurexCenterofExcellenceJan2016 PRESS RELEASE Team Trade creates its «Murex Center of Excellence» and consolidates its alliance with the vendor Paris, 19 January 2016 – Team Trade - A Synechron company has just launched a «Murex Center of Excellence» for the purpose of gathering and improving consultants’ skills and competencies around the MX.3 platform and also to broaden and consolidate its technical and functional services offer. 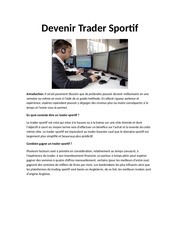 Lien, he is also the primary contributor to the forex section of the Investopedia website where his library of articles address a variety of technical and fundamental approaches to trade the currency market. 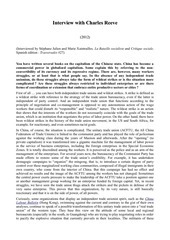 Meanwhile, trade agreements have ploughed ahead, ruthlessly enforcing agreements whose very foundation relies on diminished national sovereignty. 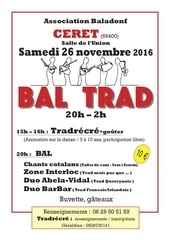 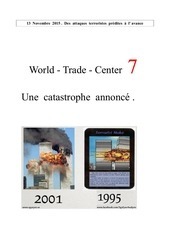 world trade center prediction 13 Novembre 2016 .
world trade center prediction 13 Novembre 2015 .